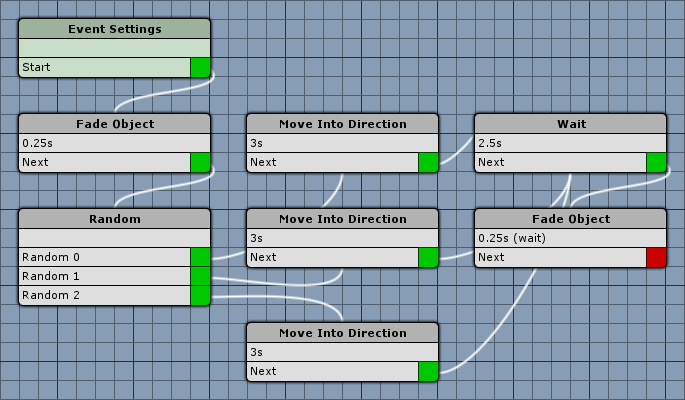 First, we’ll create a Move Event – a simple type of event that we can use to animate (move) a flying text in the scene. Open the ORK Framework editor and navigate to Events. Click on New Move Event to create a new move event. A move event is a simple event that can be used to move objects around. We’re creating a move event that will randomly move our flying text object into a direction. We want to fade the object from no alpha to full alpha. Set alpha (A) to 0. Set alpha (A) to 1. This step will randomly execute one of the connected steps – we want to connect three steps, so add them by clicking on Add Step. Moves the object into a defined direction. Set to X=1, Y=0, Z=0. The rest of this step’s settings can be ignored. Copy this step two times, connect them to the random step and change the following settings. We want to fade the object from full alpha to no alpha. That’s it for our move event – click on Save Event and save it as notification1 in Assets/Events/Move/. Now we set up how to display changes to HP and MP. Navigate to Status > Status Values. First, select HP and change the following settings. Click on Add Flying Text to add flying text settings. We want the damage flying text for player and enemy combatants to use different colors, that’s why we disabled Enemy here. This flying text will display positive changes to the status value (i.e. healing/refreshing). The % sign will be replaced with the actual value. With this setting enabled, the flying text will count to the real value instead displaying the value right away. We will start counting from 50 % of the real value – e.g. counting from 10 to 20. The counting will slow down at the end. The counting will take 1 second. Now, we also want to flash the game object of the combatant. Select a white color (R=1, G=1, B=1). Select a green color (R=0, G=1, B=0). This flying text will display negative changes to the status value (i.e. damage). Select a red color (R=1, G=0, B=0). That’s it for the player/ally flying texts – scroll back up to Flying Text 0 and click on the Copy button to duplicate the settings (since all we want to do is use a different color for enemy damage). That’s it for the HP. Now, select MP from the list and change the following settings. That’s it for MP, we only want to display a refreshing number, no flash or damage display. Open the main menu scene (0 Main Menu) and hit Play. Walk outside of the town and into the battle. Now, at least, you’ll see what’s going on regarding the status value changes from attacks, abilities and items. In case you’re wondering why you’ll sometimes (or often) can simply walk around after a few rounds and the enemy is still standing around – that’s because you’re dead, and there is no Battle End Event yet that will handle this situation. But that’s a topic for another tutorial. And that’s it for now – the next lesson will cover animating the battle.